For the last several years Smarty had birthday parties traditional in our area - we rented a Pump It Up party place, invited a fair number of kids, served cake and pizza, and drove home. But this year we told Smarty that she is getting too old for this kind of parties. 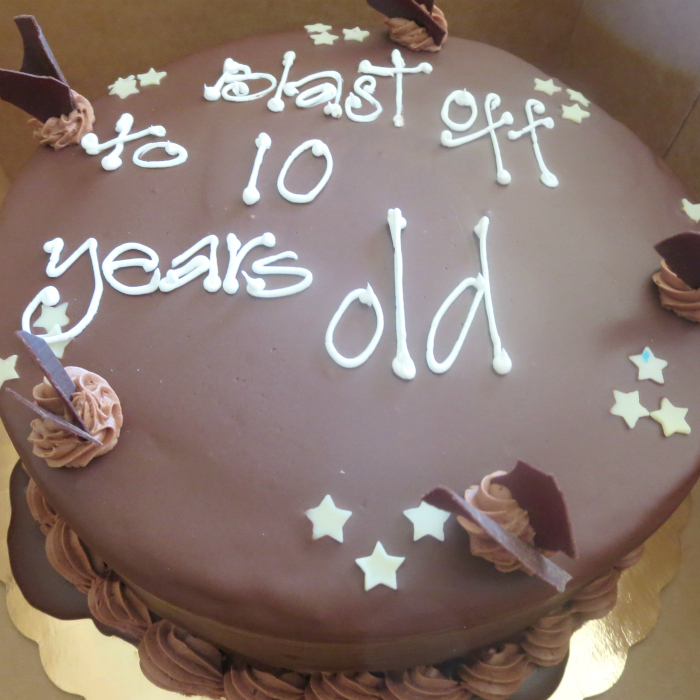 She asked instead to invite her closest friends and to celebrate her 10th birthday with a theme of blasting off to space. 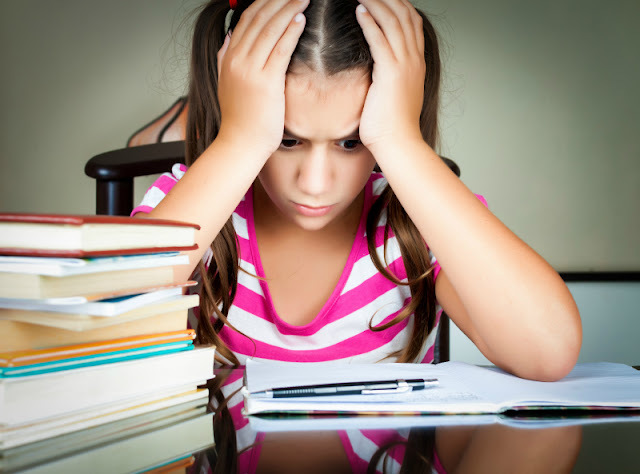 I am not a creative person when it comes to party planning, so I asked for help in my favorite Facebook group of parents of gifted children and they came through with a lot of great ideas. I was excited by the idea of getting some new board games like Star Munchkins or Cosmic Encounter and having a board game party. Alas, Smarty firmly vetted this idea saying that she wants her party to be "fun and energetic". She was a lot more interested in Minute to Win It games like Defying Gravity and Junk in the Trunk. She also approved the idea of playing space themed charade games. 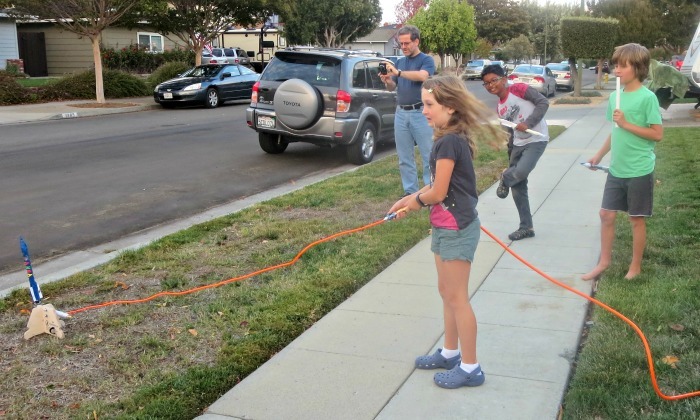 What she really wanted to do, however, is to build and launch rockets. Smarty was lucky. 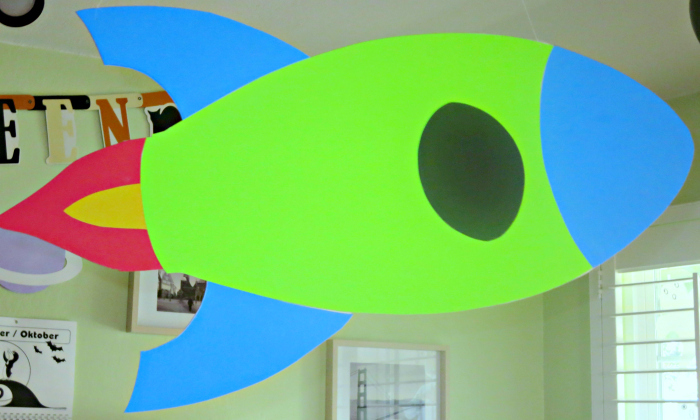 She has an amazing STEM teacher in school whose hobby is to make things that fly. He has a company that produces high pressure air rockets. We've seen them fly at a local Makers' Faire, and my husband was very intrigued by them. Originally, he wanted to build his own rocket launcher, but then he weighed this new project against all other projects already on his plate and chose to give Smarty (and himself) an early birthday present of an air rocket launcher. 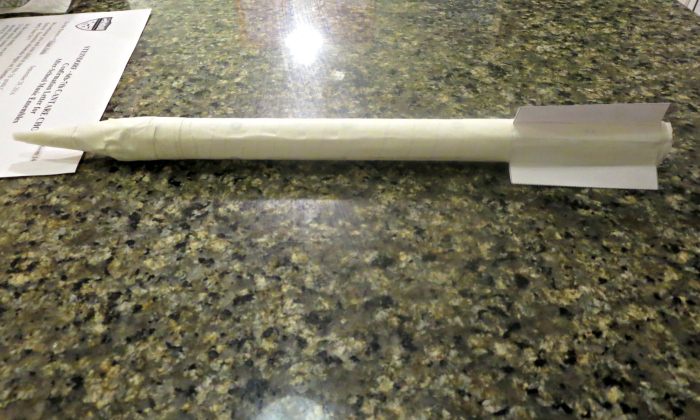 The rockets themselves can be built from a single sheet paper rocket template, and they fly amazingly well. Smarty and her friends spent about 20 minutes building their rockets and another 45 minutes launching them despite the blistering wind. My husband also made space charades game for the party. He and I brainstormed together a fairly long list of "space words" and he made the cards for the game. Originally, we planned to play it in teams of three, but one of Smarty's friends was sick and could not make it to the party, so kids just took turns being a person doing the charade while the rest of them guessed. If the guess was correct, a person who acted out the word and a person who guessed a word got a "moon rock" as a prize - a candy bar wrapped in aluminum foil. 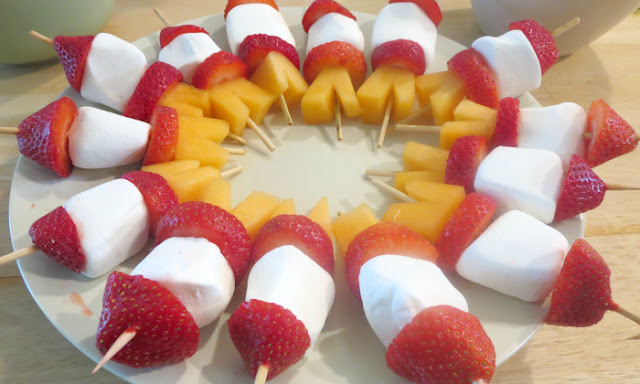 The highlight of our snack table were these fruit rocket skewers. Smarty had more "space snacks" in mind, but we opted for traditional birthday fare - pizza, and, of course, cake. 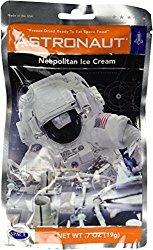 We did not feel that Smarty's tween friends need more plastic trinkets, but they all got to take their paper rocket home together with their "moon rocks" and astronaut ice cream. Did you throw theme birthdays for your kids? What kind? I love the fruit rockets! Not too surprisingly we have both of those games. Cosmic Encounter is one I don't particularly like, but Jeff and the boys do. 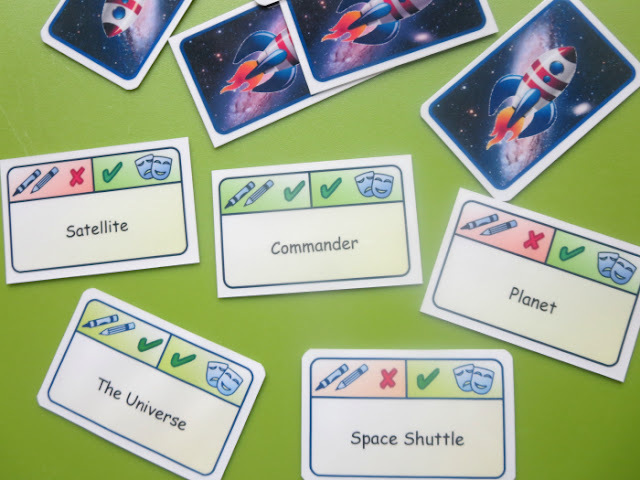 Space Munchkin is a stab your friend in the back type of game that spoofs sci-fi movies (a lot of Star Trek spoofs). But back to what you actually wrote about, I love those fruit rockets and the activities you came up with. They're pretty fun looking. Awesome birthday party it was! This Space Themed Food was just so fabulous. 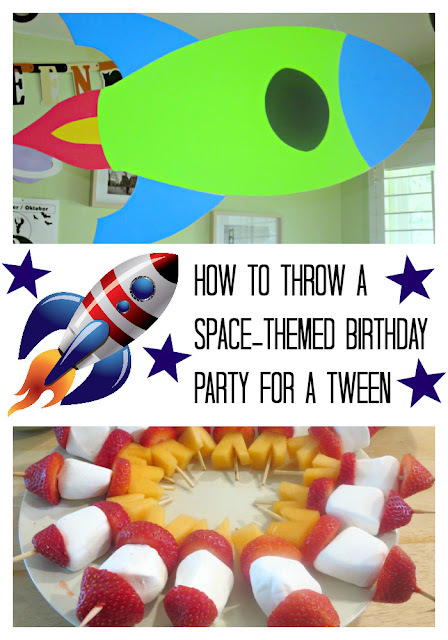 This post was super inspirational for me as well because my kid also loves spaces and astronauts kinds of stuff so I would love to replicate this bash for him. Planning to book one of the Los Angeles venues for the day.